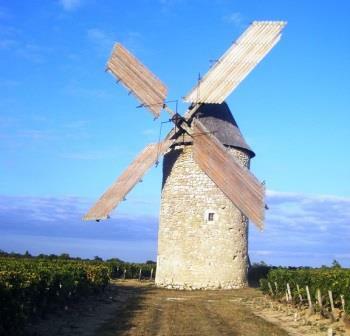 Chateau Tour Haut Caussan is as well known for its windmill as they are for their wine. In fact, their windmill, is not only the focal point of their property, but it is also the main part of the logo on their wine label. Located in the far north areas of the Medoc, the estate has been in the hands of the same family, the Courrian family, since 1877. However, the Courrian family has much deeper roots in the Bordeaux region as they can trace their heritage in Bordeaux all the way back to 1634. Chateau Tour Haut Caussan is owned by Philippe Courrian, a direct descendant of his great, great grandfather who purchased the estate in the late 1800’s. His son and daughter, Fabien Courrian and Veronique Courrian currently manage the estate today. The 17 hectare, Left Bank vineyard of Chateau Tour Haut Caussan is planted to an even split of 50% Cabernet Sauvignon and 50% Merlot. The terroir is clay, limestone and gravel soils. You can divide the vineyard into 2 large blocks, with the better part of the vineyard being situated not that far from Chateau Potensac. To produce the wine of Chateau Tour Haut Caussan, vinification takes place in large oak barrels. Malolactic fermentation takes place in oak vats. The wine is aged in an average of 30% new, French oak barrels for 15 months before bottling. There is a second wine, La Landotte. On average, the estate produces close to 10,000 cases of Chateau Tour Haut Caussan each year. The Courrian family also produces the following wines from vines they own in the Corbieres appellation; Chateau Cascadias, La Roque Dansante, Le Chant de la Cascade and Le Tannat de Philippe Courrian. Chateau Tour Haut Caussan is a solid example of a Bordeaux value wine from the Medoc that delivers character for a fair price. Chateau Tour Haut Caussan in its youth can be decanted for an average of 1 hour or so. This allows the wine to soften and open its perfume. Older vintages might need very little decanting, just enough to remove the sediment. Chateau Tour Haut Caussan is usually better with at least 2-4 years of bottle age. Of course that can vary slightly, depending on the vintage character. Chateau Tour Haut Caussan offers its best drinking and should reach peak maturity between 4-12 years of age after the vintage. Chateau Tour Haut Caussan is best served at 15.5 degrees Celsius, 60 degrees Fahrenheit. The cool, almost cellar temperature gives the wine more freshness and lift. The wine of Chateau Tour Haut Caussan is best served with all types of classic meat dishes, veal, pork, beef, lamb, duck, game, roast chicken, roasted, braised and grilled dishes. Chateau Haut Tour Caussan is a perfect match with Asian dishes, hearty fish courses like tuna, mushrooms and pasta as well as cheese. Medium-bodied with a fresh, red and black cherry, tobacco and earth profile, this wine will be open and young yet should get better with some aging too. Medium bodied, with dried red pit fruits and soft tannins, this will be best over the next few years. Round, juicy, fresh and fruity, with a kick of espresso and black plums in the medium-bodied finish. This 50% Merlot and 50% Cabernet Sauvignon blend created a forward, easy to like wine with soft textures and a sweet, dark cherry, earthy core of fruit that will be best tasted on the young side. Forward, earthy, crisp wine, with a strong, tobacco, leaf and herbal leaning is on the bright, fresh, crunchy, red berry side of the style range. I'd opt for drinking this in its youth. Medium bodied, with a fresh, black cherry, earth, tobacco leaf and spice driven profile, this can be enjoyed young, or give it another few years for more development. It's not going to make old bones, but for this price, it's a true Bordeaux value wine. The wine was made from a blend of 50% Merlot and 50% Cabernet Sauvignon. From a blend of 50% Merlot and 50% Cabernet Sauvignon, this forward styled, medium bodied, slightly earthy, cassis and cranberry dominated wine will be best if tasted on the young side.